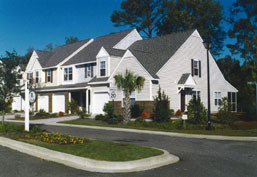 This community of 181 townhouses was planned at a density of 8 DU/AC for a site in Pawleys Island, SC. Five unit types were available, including two master-down plans. All plans featured a one-car garage and various options including a rear screened-in porch. The models are in the 1,200-1,500 SF range. A central swimming pool and retention pond are site features.